If football wants to make a fundamental change in protecting players from neurological harm -- and to avoid being regulated out of business by Congress -- rules tinkering won't do. Radical change is required. What's needed is to rethink the helmet, making it safer for both the player who wears it and the player being hit. Here's how: Put padding on the outside of the helmet, so the helmet stops being a weapon. Pick up any recently manufactured football helmet from high-quality names Riddell and Schutt, or from Rawlings, which will re-enter the football helmet market next year. Slam it down on a workbench -- your arm will vibrate. The polycarbonate outer shell of a modern football helmet strikes like a sledgehammer. The modern helmet is stronger than the clubs warriors beat each other with in the Middle Ages. Put a modern football helmet on your head -- it feels like a weapon. No surprise, then, that knowing they are wearing weapons on their heads, football players use helmets in that way. So pad the outside. It's been tried before, and it worked. Doug Collier/AFP/Getty Images A Conehead helmet didn't stop him from playing Pro Bowl football. Mark Kelso, a safety for the Bills from 1986 to 1993, wore an outer-padded helmet as a starter in four Super Bowls and finished with 30 career NFL interceptions. Many highly drafted, highly paid safeties wish they could say they had a career as good as Kelso did. 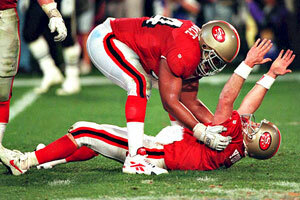 Steve Wallace, an offensive tackle for the 49ers from 1986 to 1997, wore an outer-padded helmet and made the Pro Bowl. Many highly drafted, highly paid tackles wish they could say they played as well as Wallace did. You can wear an outer-padded helmet and be a very effective football player -- while doing less harm. Kelso went to outer padding because he'd sustained two severe concussions and been advised to give up football. "The Bills' trainer knew an inventor who had been tinkering with padding," Kelso told me last week. "With padding, I played an additional five seasons, almost 100 more games, and sustained only one concussion, which wasn't a helmet-to-helmet hit -- someone kneed my head. Absolutely the padding made it safer for me and safer for the players I was hitting. You can't use an outer-padded helmet as a weapon. Pound a padded helmet against your own knee; it doesn't hurt. Do that with a standard polycarbonate shell helmet, and you'll howl in pain. If both players were wearing this in a helmet-to-helmet hit, it wouldn't be anywhere near as bad." Spectators and TV announcers made fun of Kelso and Wallace for resembling the Coneheads on "Saturday Night Live," although eventually the inventor, industrial designer Bert Straus, made outer padding less conspicuous. In recent years, he's been trying to design an entire helmet based on a soft outer surface. Page 2's Paul Lukas wrote about the helmet designs in this 2008 Uni Watch column. "The only real objection to the idea was aesthetic," Kelso said. "Players thought the padding didn't look cool, so they didn't want it. I started calling the padding 'resilient' rather than 'soft' because they made fun of the word 'soft.'" So what's standing between current football helmets and far safer helmets -- safer for the wearer, safer for the person being hit -- is looks and the word "soft." If everyone were required to wear an outer-padded helmet, initially all football players would complain about a geeky appearance. Within a year, the padded helmet would be perceived as normal and the appearance forgotten -- while severe injuries declined. Put a soft helmet on Ray Lewis' head. Would this cause anyone to think he's soft? So, NFL -- if you really care, as you claim, about reducing head trauma risk, require that outer padding be added to all helmets beginning in 2011. Colleges and high schools will follow suit, since adding padding is not expensive. Mainstream helmet manufacturers, who have shied away from outer padding on fears that players won't wear it, will jump in with all-new, safer designs if the NFL takes the lead with a mandate. Football helmets, and football play, can be made substantially safer with a simple, affordable equipment improvement. The only reason not to take the step is that there would be grumbling about looks. Looks mean more than safety? Especially the safety of the 1 million high schoolers who are the majority of America's football players? The outer-padded helmet is the helmet that can save football. In other sports news, the NBA tips off Tuesday. A labor-relations train wreck seems more likely in basketball than in football -- there's so much money to go around in football that the NFL owners and NFL Players Association can't be dumb enough to blow it, can they? Don't answer that! The NBA owners and National Basketball Players Association, on the other hand, have huge potential for killing the goose that lays the golden eggs. So savor the NBA this season while you can. Since Tuesday Morning Quarterback believes basketball is 1 percent as interesting as football, annually I devote 1 percent of column length to basketball. See basketball items scattered throughout the column. College hoops tip soon, too. Hope you didn't miss this important article on college basketball, showing cheating coaches prosper while the only coaching flaw that's punished is losing. This syncs with TMQ's contention that the structural problem of major college athletics is that coaches are lavishly rewarded with money if their teams win but not penalized if their players don't graduate. Suppose this simple rule were added to college football and men's basketball: Unless at least 80 percent of a team's players graduate, the coach is suspended for one year. That would add what's missing -- an incentive for coaches to care about education. In other football news, with eight minutes remaining before halftime at Denver on Sunday, the Oakland Raiders took a 38-0 lead over the Broncos. This would have switched the game to "running clock" under high school football mercy rules. Running clock in the second quarter! Stat of the Week No. 1: Stretching back to last season, 2009 non-playoff teams Atlanta, Pittsburgh and Tennessee are on a combined 24-6 streak. Stat of the Week No. 2: Stretching back to last season, 2009 playoff teams Cincinnati, Dallas, Minnesota and San Diego are on a combined 7-23 streak after Dallas' 41-35 loss to the Giants on Monday night. Stat of the Week No. 3: Josh McDaniels won his first six games at Denver and since is 4-13. Stat of the Week No. 4: Matt Ryan is 16-1 in home starts. Stat of the Week No. 5: Since the start of the 2008 season, the Browns are 3-1 versus defending Super Bowl champions and 8-27 against all other teams. Noted by many readers, including Stephan Levy of Arlington, Va.
Stat of the Week No. 6: Last season, Brett Favre threw seven interceptions in 16 games. This season, he has thrown 10 interceptions in six games. Stat of the Week No. 7: Jacksonville has beaten the defending AFC champion Colts, and lost games by 27 points, 25 points (twice) and 22 points. Stat of the Week No. 8: (College bonus.) Oregon scored 60 points on offense against UCLA -- and the Ducks' time of possession was 21:29. Stat of the Week No. 9: San Diego is ranked No. 1 in offense and No. 1 in defense. Here is the NFL's team stats page -- four of the six league-leader symbols are for San Diego. Yet the Chargers' record is 2-5. Denver Broncos Page 2 favors strict environmental regulation. Cheerleader of the Week: Bryan Law of Independence, Ohio, nominates Christina of the Broncos, who, according to her team bio, works for the Department of Justice as a paralegal in the Environment and Natural Resources Division. This means you could file a Freedom of Information Act request for her swimsuit photo. Wait, it's here. Suddenly, Page 2 male staffers feel an intense desire for the DoJ's environment division to conduct an intensive on-site review of ESPN's NPDES point-source runoff permit. Sweet Play of the Week: City of Tampa turned third-and-goal from the 34 into a field goal. With the Raiders facing third-and-goal from the 19, leading 24-0 in the second quarter, the Broncos' coaches called a six-man blitz. Denver's defensive call made little sense, since the best-case scenario was to hold Oakland to a field goal, and even a sack would leave the Raiders, with a strong-legged place-kicker, in kicking range. Oakland coaches called a weakside screen, surely intending to improve field goal position. With six Denver defenders sucked into the backfield, Darren McFadden took the screen 19 yards to the end zone, and Broncos fans started for the exits in the second quarter. Oakland possession results, until the Raiders stopped attempting to score: touchdown, touchdown, field goal, touchdown, punt, touchdown, punt, end of half, touchdown, touchdown, touchdown. Sour Play of the Week: What were Brett Favre and Randy Moss attempting on the third-quarter snap that resulted in an interception returned for a touchdown? Moss stepped across the line of scrimmage, did a little shake, started an out, started upfield and stopped. Then Favre threw directly into the hands of Packers linebacker Desmond Bishop. Huh? Leading 17-14, Minnesota had first-and-20 on its 24 with 35 seconds remaining in the first half, holding two timeouts, and simply let the clock expire. Huh? Under Favre, the Vikings are 11-1 at home and 4-8 on the road. The road record makes the Vikings hard to take seriously -- and come Sunday, they visit New England. Minnesota also has seven consecutive losses in night games. Minnesota plays host to Chicago on "Monday Night Football" in December -- will the Vikes be in contention or will Favre still be playing by then? Sour Play of the Week No. 2: With Philadelphia leading Tennessee 16-7 late in the third quarter, the Eagles had first-and-goal on the Flaming Thumbtacks' 3, looking to put the game away. Titans defensive tackle Jason Jones came through unblocked to hit quarterback Kevin Kolb as he attempted the handoff. Fumble, Tennessee ball and the home team went on to outscore Philadelphia 30-3 for the remainder of the contest. No one blocks the opponent's defensive tackle at the goal line -- that is seriously sour. Sweet 'N' Sour Fourth-Down Pair: Leading 23-20, New England faced fourth-and-1 on its 49 at the two-minute warning. The host Chargers stuffed the run, despite six offensive linemen on the field for the Flying Elvii; that was sweet for San Diego. New England simply used a power set, no shifts, no man in motion. That was sour for the Patriots. On fourth-and-short, defenders are primed to charge straight ahead. The offense must do a little dance to create some uncertainty. A few snaps later, San Diego faced fourth-and-2 on the New England 27 with 28 seconds remaining, holding two timeouts. In January 2008, Norv Turner lost the AFC Championship Game to Bill Belichick largely on ultra-conservative fourth-quarter decisions in New England territory. Now he's in New England territory again at the endgame. Turner has the league's No. 1-ranked offense. He's playing at home. Gain 2 yards, and the Bolts are in position to win, not merely tie, especially considering Turner has two timeouts in his pocket. Plus, backup kicker Kris Brown missed both his endgame pressure kicks of 2009 and was let go by Houston owing to this. Go for it! Turner sent out the field goal team for a 45-yard attempt; San Diego jumped offside, making it a 50-yard attempt; Brown missed. A 50-yard field goal attempt is a 50/50 proposition, and going to overtime is itself a 50/50 proposition -- so as the kick boomed, Turner was essentially putting his chips on a 1-in-4 chance of victory, as opposed to going for it on fourth-and-2 with the league's top-ranked offense. For New England, Turner's ultra-conservative decision was sweet. For San Diego, it was sour, sour, sour. Gary Dineen/NBAE/Getty Images We'll give you a first-round draft choice and $3 million to take him. Want a fruit basket in the deal too? 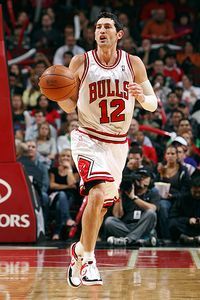 Amusing NBA Trades: The Chicago Bulls sent their first-round draft pick and Kirk Hinrich to the Washington Wizards for a second-round choice. A first and a player for a second suggests Hinrich has negative value. Which was the case; Chicago's objective was to unload Hinrich's guaranteed contract. Chicago was so desperate to remove Hinrich from its books that it threw in $3 million to help Washington pay the contract. Miami traded a first-round choice and Daequan Cook to Oklahoma City for a second-round choice -- again the player, Cook, had negative value, and again the point was to unload his contract. Unified Field Theory of Creep: Justin Martineau of New Orleans reports, "Starting in January, license plates for the bicentennial of the statehood of Louisiana will become the state's standard. The date of ascension is April 30, 1812. These plates are 16 months early." Robert Drago of Washington, D.C., writes, "Tonight I downloaded the latest Norton security update, and it was advertised as Norton 2011. Is Norton taking a holiday for the rest of 2010?" Joost Smets of Uffelte, Netherlands, writes, "Recently, I noticed an advertisement in my newspaper for the joint Dutch/Belgian bid for the 2018 and 2022 soccer World Cup. Not only does 2018 sounds like distant future to me, the Netherlands have never organized a World Cup, and already we're looking forward to host the tournament for the second time." Dwight Peck of Phoenix reports, "On October 15, I received the spring 2011 catalog from Eddie Bauer." Are You Descended from a Venusian? Venus is the planet most similar to Earth -- about the same size as our world, made of similar elements. 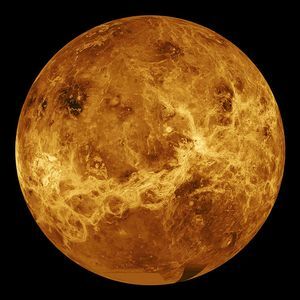 Closer to the sun, Venus has a surface temperature of around 900 degrees Fahrenheit, almost all its water has boiled off and a runaway greenhouse gas atmosphere causes atmospheric pressure 92 times greater than Earth's. The planet appears to have no carbon cycle -- no plants or geological processes subtract carbon dioxide from the air, as happens here -- resulting in a very thick atmosphere. Natural global warming probably killed any Venus life that might have once existed. NASA The homeworld of life on Earth? Because of these things, cosmologists long have assumed Venus foretells what will happen to the Earth far into the future, when Sol expands before going supernova: Earth's water will boil off, carbon dioxide will choke the atmosphere, life will end. That's the distant future, hundreds of millions of years from now, by which time humanity will have either evolved into a higher form or gone extinct anyway. But if Earth will become like Venus in the future, was Venus like Earth in the past? An eon ago, the sun was faint compared to today and the inner solar system less hot. Here, researchers speculate that a billion years ago, Venus had surface water, lower temperatures and less atmospheric pressure -- the planet might have been habitable to the kind of life we know about. Reading this, I thought: What if there was civilization on Venus an ego ago, a civilization that either evolved into a higher form or fell extinct? A billion years later, there is no trace remaining. Or perhaps far in the past, a civilization on Venus escaped the malfunctioning of its environment by seeding life here, the next planet outward from the sun. So far there's no clue about how terrestrial life began. Darwinian evolution suggests how organisms that already exist form new species, but Darwin was silent on what created life. Microbes came into being nearly 4 billion years ago, but complex animal life appears to have begun relatively rapidly between 530 and 570 million years ago. Maybe that was the time a Venusian civilization was dying. Maybe we find no clues of the origin of complex biology here because this process began on Venus. Perhaps a billion years from now, thinking beings on a distant world will wonder how their biology became so complex, unaware it was transplanted from the long-dead Earth. AP Photo/Alan Diaz He fumbles at the 1! The ball is recovered by . . . we'll get back to you on that. Adventures in Officiating Just before the two-minute warning, with the Steelers trailing the South Florida Dolphins 22-20, Ben Roethlisberger dove toward the goal line and the ball bounced free, followed by a pileup in the end zone. Zebras signaled touchdown; Tony Sparano challenged. Referee Gene Steratore announced Roethlisberger had fumbled before scoring, taking the six points off the board, but that on review he could not determine who recovered the fumble, so the ball would be returned to the point of the fumble, making it Pittsburgh fourth-and-goal on the Miami 1. 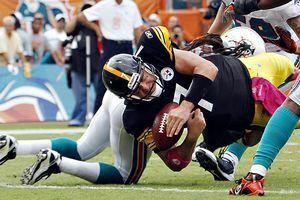 The Steelers kicked for a 23-22 lead and a moment later stopped South Florida's fourth-and-6 pass attempt when tackle Vernon Carey, a first-round draft pick, failed to stay with his man despite the Dolphins having five blockers for three Pittsburgh rushers. The second part of the ruling -- that review couldn't tell who recovered the ball -- reflects an officiating problem that has been driving TMQ crazy for years. In a scramble for a loose ball, if any player takes possession for even an instant, with a knee down and in contact with an opponent, the play should end. But zebras don't officiate mad scrambles this way. They let the players fight for the ball, then award possession to whoever wins the Darwinian struggle. Often the fighting continues although all players involved have their knees down. Right after Roethlisberger fumbled, Randy Starks of Miami put his hand on the ball, pressing it against the turf, both his knees down, in contact with a Steeler. Play over -- Dolphins' ball. Another Steeler knocked the ball away from Starks, and then so many people piled into the end zone that it became impossible to determine who had possession. This should not have mattered. Who cares whether Starks held the ball for only one second? His knee was down and he was in contact; the play should have ended. This was a seriously botched call by the officials, and it's a category of botched call one sees in high school, college and the NFL. On a fumble or onside kick, if a player with his knee down and in contact has the ball for even a second, the play should end. The whistle should sound, and the mad struggle to rip the ball away should not continue. The Steelers, allowing a league-low 14 points a game and on a 5-0 streak against the Dolphins, now have 377 regular-season wins since the 1970 merger. This passes the Dolphins, who are second in post-merger wins with 375. The Unnecessary Roughness Rule Means More Than the Helmet-to-Helmet Rule: Often it's impossible for officials to be sure whether a player intended to lead with his helmet. A defender coming up to make a hit, for instance, might be aiming at the offensive player's chest. Suddenly the offensive player lowers his shoulder, and their helmets strike. Maybe that's not the defender's fault. Unnecessary roughness, on the other hand, usually is clear. If a player is already going out of bounds, it is "unnecessary" to hit him -- any hard hit on a player already going out of bounds should draw a flag, regardless of whether the helmet is involved. If an incompletion has already gone by a receiver, it is unnecessary to hit him -- any hard hit on a receiver after the pass passed by should draw a flag, regardless of whether the helmet is involved. that shot should not be penalized." NFL vice president Ray Anderson calls the Robinson "shot" (Mayock's word) illegal in this league instructional video sent to clubs Friday. As regards the hit by Leonhard, sorry, Mike, there is a clear penalty -- unnecessary roughness. Leonhard (whom TMQ has singled out for praise before) and Mayock might have been raised in a football culture in which coaches encourage safeties to drill players going out of bounds. Now that he's securely in the broadcast booth, Mayock might find it entertaining to watch players attempt mindless-brute harm. Neither means officials should tolerate such conduct. In the latest NFL rulebook, the definitions of unnecessary roughness run 14 paragraphs, many based on "launching" or on behavior that accomplishes nothing beyond making the hit harder. But the key rule -- 12, 2, 8 -- simply reads, "There shall be no unnecessary roughness." Officials have broad jurisdiction about what is unnecessary in football. Active enforcement of this rule would go a long way toward changing the mindset that viciousness for its own sake is OK.
Sunday at Denver, the Broncos' Spencer Larsen was going out of bounds under tackle with Raiders safety Tyvon Branch closing hard. At the instant Larsen touched the out-of-bounds line, Branch pulled up and made no contact. Just a week before, Branch might have delivered a hard hit -- that's what football players are coached to do in this situation. On Sunday, Branch was careful to avoid an unnecessary hit. This past Sunday at San Diego, Patrick Crayton of the Chargers caught a pass across the middle with Brandon Meriweather of the Patriots coming straight at him from the opposite direction. This is the situation in which, the week before, Meriweather leveled Baltimore's Todd Heap with a vicious helmet-to-helmet hit that Anderson called "inexcusable." This Sunday, Meriweather made a proper-form wrap-up tackle on Crayton. These are exactly the kinds of changes in behavior needed for the culture of football to change. And this Sunday's games were amply fast-paced and exciting, without the dangerous behavior of the Sunday before. AP Photo/Richard Drew He was honest. What a blunder! When George W. Bush's Corporation for Public Broadcasting Tried to Purge Liberal Views, the Left Called This an Outrage: Recently TMQ did an item about National Public Radio changing its name to NPR. 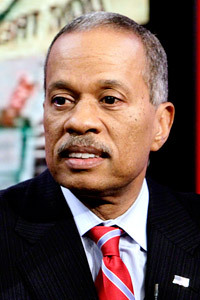 Last week the organization changed its name again, to NTPR -- National Thought Police Radio -- by firing commentator Juan Williams. For NTPR to act horrified when its sole prominent right-of-center commentator -- commentator, not newscaster! -- utters remarks unacceptable to the limousine liberal circuit is political correctness gone berserk. There is plenty to disagree with in Williams' opinions, but what he says clearly is presented as opinion. "Williams' presence on the largely conservative and often contentious primetime talk shows of Fox News has long been a sore point," NTPR said in announcing the sacking,, adding prissily -- as if Hester Prynne's personal life were the topic -- "strong criticism followed Williams' comments." The horror! If having a viewpoint and sparking criticism are scarlet letters, all NTPR programs except "Car Talk" and "Splendid Table" should be canceled. 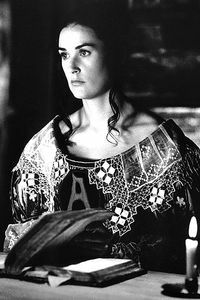 Buena Vista Pictures NPR immediately fired Hester Prynne upon learning she said she was nervous when placed in the pillory near witches. TMQ is a longtime listener and sometime donor to public radio, and thinks the network does mainly a fine job. But now that it's clear public radio's Washington headquarters has been lying in its long-standing contention that the organization is impartial, public funding must end. It would be offensive if money were forcibly extracted from taxpayers' pockets to fund right-wing dogma on Fox News. It is offensive that money is forcibly extracted from taxpayers' pockets to fund left-wing dogma at National Thought Police Radio. The full context of Williams' remarks was that he has felt frightened when encountering Muslims on airplanes but also understands that assuming Muslims are extremists is wrong. From his writing on the civil rights movement -- Williams' biography of A. Philip Randolph is terrific -- he knows prejudice cannot be resolved until it is first confronted honestly. Yours truly having lived in Pakistan, I can report that most Muslims are peace-loving, law-abiding people. (Yes, there are dangerous Islamic fanatics -- there are dangerous Christian, Jewish and Hindu fanatics, too.) Open-mindedness about the good and the bad of Islam won't happen until United States society learns to talk openly about its biases regarding Muslims. Williams was just being honest. What a Relief the Rest of the Media Is Totally Non-Ideological: The same day National Thought Police Radio's sacking of Williams made the papers, The New York Times' front-page lead headline was "LARGE DONATIONS AID U.S. CHAMBER IN ELECTION DRIVE," expressing alarm that the Chamber of Commerce is promoting its political opinions. Also that day, The Wall Street Journal's front-page lead headline was "PUBLIC-EMPLOYEE UNION LEADS ALL GROUPS IN INDEPENDENT ELECTION OUTLAYS," expressing alarm that AFSCME is promoting its political opinions. Dr. Jekyll and Mr. Martz: Washington at Chicago offered six interceptions, eight fumbles and six sacks. Despite going into the contest with the league's most sacks allowed, the Bears sent five or four receivers into the pattern on almost every passing play, sometimes with no blocking help, other times with only a tailback, not a tight end or fullback, as an extra blocker. WTM!? ("What the Martz," to TMQ faithful.) On the 92-yard DeAngelo Hall interception return touchdown that provided the game's winning points, the Bears had six blockers for five rushers, yet no one touched Redskins defensive lineman Vonnie Holliday, who hit Jay Cutler as he released, causing the pick-six. The Bears now have allowed a league-worst 31 sacks and are a miserable 15-of-84 on third downs. Counting sacks and scrambles, Mike Martz has called 261 passes and 141 rushes. How's that working out for you, Bears? The Basketball Gods Chortled: Last season the Mavericks beat the Knicks by 50 points and lost to them by 34 points. The Timberwolves scored 114 points against the Suns -- in a game the Timberwolves lost by 38 points. Manly Man Fake Punts of the Week: Trailing Iowa 30-24 with four minutes remaining, Wisconsin faced fourth-and-4 on its own 26. The Badgers called the "sleeper" fake punt on which the punter takes a couple of steps as if intending to kick and the coverage team starts downfield as if the punt is already on its way (surely one of them yelling, "Go!" or whatever the Wisconsin code is that means the punt is launched); then punter Brad Nortman simply ran up the middle for 17 yards. Wisconsin scored on the possession and won. For his run, Nortman almost seemed to tiptoe -- and the moment an Iowa defender approached, he did a hook-slide. Leading 10-0 at New Orleans, Cleveland ran the sleeper fake punt, and punter Reggie Hodges went 68 yards, plowing ahead like a fullback for the final few yards. The throwback trick-play punt return -- thrown across the field by Josh Cribbs, a college quarterback -- sure looked good, too. ESPN.com "Of all the awards I have ever received, this award from TMQ is certainly the most -- recent." Tuesday Morning Quarterback Non-Quarterback Non-Running Back NFL MVP Curse Returns: For years there was a curse attached to the coveted "longest award in sports" -- Lincoln Kennedy, Damien Woody and Troy Brown immediately got hurt or were let go after winning it. Then for several years things went peachy for the recipient. On Sunday, Jahri Evans of New Orleans, last season's runner-up, had a cover-your-eyes awful game. And this hasn't been the best couple of weeks for James Harrison, who was the winner before Clark. Big Hits, Big Excuses: Two years ago, TMQ noted Roger Goodell sent all NFL players and coaches a letter about big hits, warning: "Any conduct that unnecessarily risks the safety of other players has no role in the game of football and will be disciplined at increased levels." So enough with this moaning that the crackdown on big hits comes out of the blue. Goodell warned about a crackdown two years ago. Players and coaches just didn't listen. In the past week, a few former NFL players have endorsed the league's move to reduce vicious hits. Rodney Harrison of NBC called for suspensions, while Steve Young of ESPN said "the media must stop glorifying big hits." Yet many former players have denounced the initiative. Let's examine their arguments. • "They can't change the game:" Dolphins linebacker Channing Crowder to AOL FanHouse. They change the game constantly! Once a field goal was five points. Once the forward pass was illegal. Once an incompletion was a turnover. Once there was no rule about how many men the offense had to put on the line of scrimmage. The manner in which football is played has changed countless times. Plus, all game rules are fundamentally arbitrary. Why should there be seven men on the line of scrimmage? I don't know, you don't know and neither does anyone else. Why does a rook move horizontally and vertically while a bishop moves diagonally? Please don't tell me these qualities are inherent to rooks and bishops! Whatever else it is, the NFL is a well-run business. The perception of viciousness threatens the business model, so the league is wise to react. Very highly paid NFL players ought to appreciate this. Nothing stops them from quitting the NFL and forming the Neanderthal Football League, with no holds barred and final scores of 6-2. A few people would buy tickets, but only a few. • It was "criminal" for Goodell to fine James Harrison for helmet-to-helmet hits: Mark Schlereth on ESPN. No one aimed a gun at Harrison and forced him to join the NFL. If Harrison wishes to perform in the league, he must abide by its rules. Schlereth went on to say, "The NFL is a vicious game, that's why it is so popular." Really? Most former NFL players were coached to think brutality is natural to the sport and only the most violent players excel. This is not necessarily true -- Jerry Rice, the greatest football player ever, was never violent -- but it is what they were taught, and is a fallacy they must free their minds from. Justifying more of the same is not the solution; there are many well-played, entertaining, exciting football games in which no one is harmed. • Brutal hits preserve "the integrity of the game:" Trent Dilfer on ESPN. Former players who say things like this don't seem cognizant that 95 percent of football occurs at the high school level, and high school players emulate what they observe in the pros. If a small number of grown men being paid millions of dollars want to play football in a brutal fashion, so be it for them. But as Ray Anderson, the league's executive vice president of football operations, said last week, "This is not just about the NFL." Vicious NFL hits set the wrong example for far larger numbers of high school boys who will never realize a dime from athletics, but might suffer for a lifetime if they sustain a head injury that might have been avoided by safer standards of play. Former NFL players now defending devastating hits are flattering their own manhood by in effect saying "Look how violent this game is; I played it and I'm still standing, I must be macho." Points of view like this do not arise from malice toward current players. Nevertheless, the effect is to contend that because horrible things happened when the former players were in the NFL, we should accept that horrible things will continue. We should not accept that. • All former football players who today provide commentary for CBS, ESPN, Fox and NBC are smart, good-looking, clever, charming. If I were casting a football show, I'd pick that kind of guy too. But because former players in poor condition are not represented in broadcasting, young players receive a distorted perspective. What if Earl Campbell -- who at age 55 has multiple health issues and has at times been forced to use a wheelchair -- were an ESPN or NFL Network commentator? Campbell loves football just as much as anyone. Maybe he would feel differently about tolerating blows to the head. The Football Gods Chortled: Iowa State defeated No. 22 Texas in Texas -- after the Cyclones lost their previous two games by a combined 120-27. Flaw of This Proposal: It Assumes the NCAA Cares About Education: Reader Steve Hasegawa of San Francisco proposes this fix for the one-and-done problem plaguing college basketball: "Instead of allowing each school 13 one-year basketball scholarships annually, the NCAA should allow a total of 13 four-year basketball scholarships. If a player only sticks around for a year, the school is stuck with three years when it can't use that scholarship (with an exception for players who transfer but remain in college). Schools would have an incentive to limit, though not necessarily eliminate, reliance on obvious one-and-done candidates. One-and-done players would spread out to a larger number of schools, increasing competitive balance." Buffalo Offense Held to 506 Yards: For Oakland, 508 yards of offense translated into a fantastic 59-14 victory; for Buffalo, 506 yards of offense translated into defeat. Seven years ago the Bills abandoned as their colors red, white and American-flag blue -- not to put too fine a point on it, but the single most successful color scheme in world history -- and the football gods still haven't forgiven them. In overtime at Baltimore, Buffalo tight end Shawn Nelson lost a fumble at the Bills' 45, on a play that sure looked like forward progress should have ended the down. Distressing for the winless Bills, but the Ravens were still out of field goal range. Buffalo center Geoff Hangartner threw his helmet, and the 15-yard penalty moved the home team into position for its winning kick. Hangartner scored 47 of a possible 50 on the Wonderlic intelligence test at the combine. Why wasn't he smart enough not to throw his helmet? AP Photo/Thomas Kienzle Chicken on a grill -- call the NCAA! 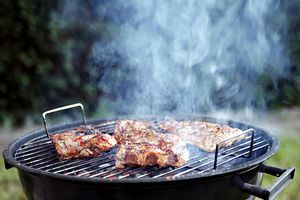 NCAA Hypocrisy Watch: So the Tennessee men's basketball coach is in trouble for hosting a barbeque at his house in ultra-literalistic violation of recruiting-visit regs. The Volunteers men's basketball program graduates a pathetic 38 percent of its players. The NCAA and apparently the University of Tennessee regents don't care. But an unauthorized bratwurst -- OMG! Where Is NOCSAE? The World Wonders: TMQ noted in 2007 and again in 2008 that NOCSAE, the organization that puts a stamp of approval on sports equipment, was refusing to say anything about helmets that reduce concussion risk. (No helmet can eliminate concussions.) In 2008, I noted that while NOCSAE issued an incredibly elaborate 10-page set of standards for gloves, it was totally silent on football helmets. In turn, the NFL uses NOCSAE's silence as an excuse not to mandate helmets with concussion-reducing features. League spokesman Greg Aiello told TMQ in 2007 that the NFL was waiting for NOCSAE to decide about concussion-reducing helmets, and 'til then, players can wear any NOCSAE-approved helmet. Three years later, the organization still hasn't said anything. Here, Alan Schwarz of The New York Times does a fabulous job of filling in the details of NOCSAE's determination to dodge the concussion issue. Parents of high school and youth league football players: "Approved by NOCSAE" means absolutely nothing! Helmet to Watch For: Many NFL players like the Schutt Air line of helmets, which has a traditional, cool "shell" appearance but lacks advanced, concussion-resistance engineering. The NFL's own research shows the Schutt DNA, Riddell Revolution and Riddell Revo Speed afford better protection against concussions. But the NFL won't mandate advanced designs, and many players don't like the space-alien look of the Revo Speed, the DNA and Schutt's new Ion 4D. To cite just one team, on Sunday some Arizona Cardinals were wearing the classy-looking but not advanced Schutt Air, some the odd-looking-but-safer Revo Speed or Schutt Ion. The NFL should mandate that the best models be worn by everybody. What's coming next is that Rawlings, which has not made football helmets for years, is re-entering the market in 2011 with a helmet called the Quantum. This helmet combines advanced, concussion-reducing internal engineering with the cool shell appearance of traditional helmets. Also, the Quantum weighs about a pound less than current helmets, making it feel somewhat less like a weapon to the person who wears it. I checked out the new Rawlings and was impressed that it combines safety engineering with looking sweet -- although I also hope outer-padded helmets are the next step for all manufacturers. In September, before the helmet-to-helmet controversy began, a company spokesman told me, "Rawlings is fully aware of the culture of football that leads to dangerous helmet-to-helmet hits and the change that needs to come to the game at the high school and youth levels where the most players are. When the new helmet goes into full production next year, education and sportsmanship will be primary messages in our communication to consumers." That's a positive sign. Undrafted Free-Agent Plays of the Week: Facing third-and-7 at Baltimore, seventh-round-drafted Ryan Fitzpatrick of Harvard threw a touchdown pass to seventh-round-drafted Stevie Johnson against a Ravens blitz. Undrafted free-agent tailback Fred Jackson of Division III Coe College blocked Ray Lewis while undrafted free-agent tackle Cord Howard blocked the NFL's highest-paid defensive player, Terrell Suggs. Undrafted free agent Brian Schaefering of NAIA Lindenwood -- surely you know whom he plays for! -- had a big day, too. See below. Winless quarterback note: Fitzpatrick is second in the league in quarterback rating, trailing only Peyton Manning. Maybe the Miami Heat Assume No One Will Be Selling Any Tickets for 2011-12 Anyway: When the arrival of LeBron James caused the Miami Heat to sell out their seasons tickets, the team immediately fired its entire sales staff. AP Photo/Denis Poroy The vaults were fabulous. But lack of cheer-babe professionalism doomed the Bolts. Cheer-Babe Professionalism Watch: Jake Freud of Los Angeles reports, "I attended the Chargers-Patriots game Sunday. The Chargers cheerleaders were wearing jackets, despite a balmy 69 degrees at kickoff." Maybe this explains why the Bolts are dominating the stats but 2-5 in the standings. Should Roger Goodell Be Replaced by Software? Ryan Rubio of Menifee, Calif., writes that Electronic Arts is ahead of the NFL in toning down excessive hits: "Madden, for the last decade or so, featured the 'Hit Stick', a control that causes an overly violent hit, increased chance of injury and the effect of the screen shaking. In the newest version, Madden 11, the Hit Stick is still present, but has become extremely difficult to use, plus usually results in a missed tackle. This has led to many players abandoning the electronic big-hit. In the wake of all of these concussions, it is remarkable to note that EA Sports -- in advance, no less -- turned down the level of violence, when violence in video gaming is usually turned way up." Buck-Buck-Brawckkkkkkk: Trailing Missouri 36-27 with 2:35 remaining, then-BCS No. 1 Oklahoma punted. So what if it was fourth-and-10 on its 7? I don't care if it was fourth-and-99 on its 1. This was a style-points punt -- the Sooners knew that if they went for it and failed, Missouri would be positioned to run up the score, which would make the defeat look even worse to pollsters. Stop Me Before I Blitz Again! ("Monday Night Football" Special): In Dallas this morning's attention focuses on the injury to Tony Romo, but ought to focus on a Cowboys defense that gave up 41 points and 497 yards at home. Passing involves artistry, and luck is always a factor. Running and stopping the run involve how badly the players want it -- and the Boys' defense allowed the Giants 200 rushing yards, while the Giants' defense allowed the host 41 rushing yards. Dallas leading 10-0, Jersey/A faced second-and-goal on the Boys' 7. The Giants fielded a power set with three tight ends; the Cowboys showed an unusual 4-5-2 with 10 players packed into the center of the field. Six blitz and an easy touchdown pass is tossed to Hakeem Nicks, who simply ran into the end zone and turned around. Now Dallas leads 20-7, Jersey/A faces first-and-goal on the Boys' 8. Again Jersey/A shows a power set, but this time tailback Ahmad Bradshaw goes in motion almost to the sideline. Dallas blitzes seven, easy touchdown pass to Nicks. Now the Giants have second-and-2 on the Dallas 14. Maybe it's occurred to Dallas coaches at this point that Eli Manning, like all skilled quarterbacks, wants to be blitzed. Seven blitz again, touchdown to Steve Smith, and in addition to being all but out at 1-5, the Cowboys are 0-3 at home in their palatial new stadium. NBCU Photo Bank/AP Images Porthos, bring the ball up. Aramis, set a pick. I'll go baseline. 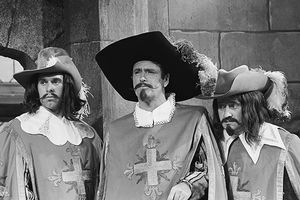 TMQ Would Have a Hard Time Deciding Who to Root for If It Was Gauchos Versus Spiders: In the men's NCAA basketball tournament, the Gaels and the Musketeers advanced to the Sweet 16. If Richmond, UC Santa Barbara and Wofford also had reached the Sweet 16, that would have brought in the Gauchos, Spiders and Terriers. TMQ thinks fans of the Wofford Terriers should chant, "Here boy! Here boy!" Best Purist Drive: Hosting St. Louis, City of Tampa staged a 16-play, 96-yard drive for the touchdown to win with 10 seconds remaining. If Only Knicks Management Got Commissions on Trades: Mike Greenberg of "Mike & Mike in the Morning" has pointed out that the Knicks have not won a playoff game in nine years -- in a league in which more than half the teams reach the playoffs -- despite spending more on players in that period than any other franchise. This is the worst record for futility since Carpathian Ruthenia. John Dunn/TSN/Icon SMI Sonny Vaccaro -- the evil super-villain of the plot to destroy basketball. This Year's Argument Against Letting Teenagers Into the NBA: Martell Webster went straight from high school to the NBA as the sixth pick of the 2005 draft and since has been a marginal player, including spending time with the Fort Worth Flyers of the D-League, a club that no longer exists. Had Webster gone to college, he would have matured physically and emotionally, and might be an NBA star today. Jeremy Tyler, a basketball prodigy who dropped out of high school to play professionally in Israel at age 17, last winter quit the Israeli team after appearing in only 10 games and averaging two points. His performance was awful. The New York Times quoted "one of Tyler's agents" complaining that Tyler wasn't showcased. "One" of his agents! Recently Tyler signed with the Tokyo Apache. Now his best-case outcome is to be a late-second-round NBA draft choice in June, spend a couple of years in the league as a minimum-salary journeyman and be forgotten. 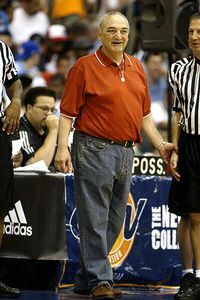 Agent/runner/shoe salesman Sonny Vaccaro, whose cause in life TMQ believes is the destruction of the NBA, was quoted by the Times as saying of Tyler's dropping out of high school, "He had every right to do what he did." That is true. Tyler had every right to throw away his promise while turning himself into a joke. This past June, J.A. Adande argued that the teens-eligible rule makes the draft nearly irrelevant to pro basketball. Most of the players picked are 19 years of age and won't become proficient for several years -- at which point they will become free agents and sign with someone else. The solution is to not allow players into the NBA until age 21. If you think that's the cranky, middle-aged, didn't-play-basketball-in-college view, Kareem Abdul-Jabbar recently advanced this idea. Nineteen-year-olds are immature physically and emotionally; they drag down the quality of NBA games while missing their opportunity to receive some education and improve in college. These are Abdul-Jabbar's points. Until such time as there might be an age-21 minimum for the NBA, Adande contends, teams should ignore the draft, concentrating on preserving cap space to sign players drafted and developed by someone else. Teams seem to be taking Adande's advice, if perhaps unintentionally -- there's a clear trend of NBA clubs simply discarding high choices. Miami used the second choice of the 2008 draft on Michael Beasley and in July traded him to Minnesota for essentially nothing, just to get rid of him. Washington traded the fifth choice of the 2009 draft for Mike Miller and Randy Foye, then a year later waved goodbye to both, netting nothing. Minnesota used the sixth choice of the 2009 draft on Ricky Rubio, who won't play in the NBA until 2011, if he ever does. Memphis used the second choice of the 2009 draft on Hasheem Thabeet, who ended up with the Dakota Wizards of the D-League. (Has anyone ever purchased the corporate-table season tickets offered by Dakota?) Last winter, the Grizzlies tried desperately to trade Thabeet, just to get rid of him, but no team wanted the player, who combines dreadful performance with an entitled attitude of stardom. Why not simply open the window and throw first-round draft choices out? Banning teens -- isn't there a "right" to play in the NBA at age 19? There's no right to be a 19-year-old airline pilot. Courts have ruled that professions may impose "bona fide" occupational requirements. Requiring NBA players to be at least 21 years of age would pass the test of bona fide, since that would improve the league's quality of play. LeBron James was an exception; as a group, basketball players in their early 20s are much better performers than basketball players in their teens. The WNBA requires players to be either college graduates or 22 years of age, and there have been no legal problems with this. AP Photo/Orlin Wagner It's hard to dismiss the view that teens should be barred from the NBA when this is the opinion of basketball's all-time leading scorer. This summer Minnesota traded Ramon Sessions, Ryan Hollins and a draft choice to Cleveland for Delonte West and Sebastian Telfair, then immediately waived West. Minnesota wanted to unload the guaranteed contracts of Sessions and Hollins, but now is stuck with Telfair, a major bust. At age 25, he is already on his sixth NBA team, a disappointment in each place. If Telfair hadn't been hyped at age 15 and then jumped directly from high school to the NBA, he might today be a star. Instead, he's a me-first type whose game never matured. When his guaranteed contract expires, he is unlikely to remain employed in pro basketball. Telfair is a walking billboard of the reasons teens should not be permitted in the NBA. Jumping to the NBA as a teen cost Telfair tens of millions of dollars in lifetime earnings potential. A similar example is Shaun Livingston, who jumped from high school to the NBA as the fourth choice of the 2004 draft. He's bounced around to six teams, including the Tulsa 66ers, and never been close to what he might have become with a few years in college. Last spring Livingston declined a contract offer from the Wizards, saying he didn't want to share the spotlight with Gilbert Arenas and John Wall -- so in six years of bouncing around, he hasn't learned anything. 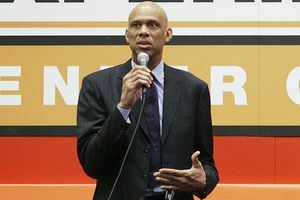 Abdul-Jabbar is right: Mandating an NBA age of 21 will not only be good for professional basketball but prevent future gifted teens from turning into the next Sebastian Telfair or Shaun Livingston. Holiday Season Creep: Joe Ladnier of Chesterfield, Va., notes, "Chippokes Plantation State Park, a Virginia state park, is holding its Plantation Christmas festival October 29-31. Not only is this a Christmas festival staged on Halloween -- it is government-sanctioned Christmas creep." Madeline Cooper-White of London reports, "I just dined at Zizzi, a fun English chain, and there were signs urging patrons to hurry to book for Christmas week." Andrew Cabiness of South Bend, Ind., reports that WSMM radio in his city went to an all-Christmas-music format Oct. 19. Getty Images Light the candles, it's October. Aaron and Gila Solomon of Ramat Beit Shemesh, Israel, report, "At our local grocery, traditional Chanukah donuts have been on sale since October 17th. 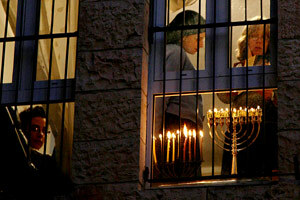 This year the Festival of Lights begins December 1st. Sufganiot, as the donuts are called, stay fresh for perhaps a couple of days." Crabtree Curse Update: Under Mike Singletary, San Francisco is 8-5 without Michael Crabtree and 6-13 with him. Note: The Broncos and 49ers will fly a combined 20,000 miles in order to meet in London on Sunday. Worst Crowd Reaction: With Seattle leading Arizona 10-0, the Blue Men Group faced third-and-16 on the Cardinals' 17. The home crowd booed loudly when Seattle coaches called a draw, then took the field goal for a 13-0 lead. A 13-point second-half lead over a troubled team with an unknown at quarterback is not exactly chopped liver. Then Arizona "krumbled" -- fumbled the ensuing kickoff. And the krumble, or kickoff fumble, is the worst turnover, since the team that just scored immediately gets the ball back. Press Association/AP Images "Brace for impact! Scotland off the starboard bow!" Submarines Gone Wild! Last year TMQ did an item on the disturbing tendency of nuclear submarines -- packed with super-advanced sensors -- to fail to detect large ships directly in their paths. 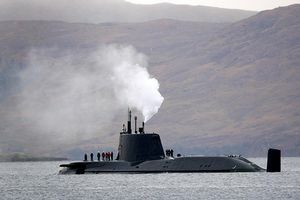 Last week, the British nuclear submarine Astute failed to detect Scotland, beaching itself when neither the sub's crew nor its super-advanced electronics noticed the boat was headed directly toward a 640-square-mile island. But the nuclear weapons won't go off by accident. Trust us. Amusing NBA Trade: When the Washington Whizzies traded Caron Butler, Brendan Haywood and DeShawn Stephenson to Dallas for Josh Howard, Drew Gooden, James Singleton and Quinton Ross, the Wizards' own website had an article explaining that the reason for the deal was that all except Ross have expiring contracts and can be unloaded, cutting Washington's payroll. Gooden note: He's now been with nine NBA teams in nine seasons, including changing teams three times in 2010 -- and the year isn't over. Cut Out the Middleman: Make the University of Kentucky an NBA Team: The NBA might contract in its next phase -- fewer franchises would make financial sense. But TMQ thinks the University of Kentucky should become an NBA franchise, since it's not even going through the motions of attempting to educate men's basketball players. The team nickname would change from the Wildcats to the Dones, short for One-and-Dones. Football Players Don't Need Unnatural Weight Gain to Play Well: Navy's offensive line averages 270 pounds, including a 256-pound left tackle who is lighter than many high school left tackles; Notre Dame's defensive line averages 291 pounds. Navy rushed for 367 yards in its victory over Notre Dame. Craig Mitchelldyer/US Presswire The boundary between points and style points keeps getting hazier. 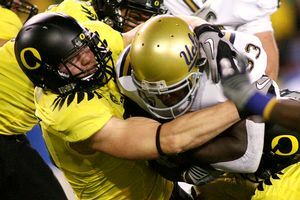 Running Up the Score Watch: The blur offense is fun to behold, but Oregon strayed into running up the score against UCLA. Leading 39-6 late in the third quarter, the Ducks still had their starters on the field and still were using blur tempo plays. The football gods frown on teams that run up the score. Leading 24-17 with a minute remaining against LSU, Auburn reached first-and-goal and simply knelt on the ball. That was good sportsmanship on the part of coach Gene Chizik. Recall that Alabama had a nearly identical situation at the end of January's BCS title bowl and Nick Saban ran up the score. Ducks note: After praising Oregon two weeks ago, I said countermeasures to the blur offense will be found. Numerous Ducks fans have asked, "What?" Martina Drullard of Glenwood, Ore., wrote, "If you're so smart, watch some Oregon tape and tell us what the counter to the offense is." OK. I watched tape of the Oregon-UCLA contest. Down after down, the UCLA defense hustled like mad to get back into position before the snap, to honor gaps. That meant that every time Oregon quarterback Darron Thomas looked up before the snap, he saw the same thing -- a conventional defense lined up exactly as it had been on all previous snaps. With its fast tempo, the Ducks' offense just assumes the defense will never vary. No offense could snap so quickly if the quarterback had to read the defense and then make his calls. So defenses facing Oregon: Don't race to get back to the same spot. Jump around. Vary your positions pre-snap. Allow front-seven players to move of their own volition, if that's all you can signal in quickly. Gamble by shifting pre-snap; racing to honor the same gap obviously doesn't work. The blur offense depends on its quarterback never having to worry about where the defense lines up. Make him worry. Obscure College Score of the Week: University of Indianapolis 6, Northern Michigan 5. With the Greyhounds leading 6-3 and facing fourth-and-8 on their 47 with six seconds remaining, Tyron Fakes of Indianapolis took the snap and ran backward all the way to his end zone for a loss of 47 yards, a deliberate safety and the end of the game. How many teams practice deliberately losing 47 yards? Located in Marquette, Mich., Northern Michigan University makes it easy to check something all colleges should make it easy to check, yet keep secret -- you can find out who graduated. Bonus Obscure College Score of the Week: Kean 29, William Paterson 2. The Pioneers faithful lament -- if only we'd gotten 14 more safeties! Actually the two points came on the return of a failed try. Located in Union, N.J., Kean University offers a master's degree in "exercise science." 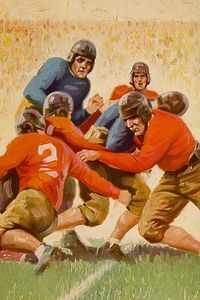 Reader Comments on the Big-Hits Issue: Andy Flaster of Lexington, Mass., writes, "What drives me crazy about 'devastating' hits is they are also examples of poor tackling fundamentals. Perhaps here the NFL can both improve the quality of the play and protect the players. In every one of the controversial cases a week ago, the defensive player was not wrapping up the offensive player, rather trying to knock him down through brute force. This tackling style often as not results in a missed tackle as the offensive player bounces off. So for penalties, why not use the defender's arm placement -- that is, proper wrap-up form -- as a tie breaker? If the defender was trying to wrap up and helmets struck, it was unintentional; if the arms weren't out, then the helmet hit was intentional. Try 'launching yourself' with both arms extended! Calling penalties based on whether the defender was attempting a proper form tackle would encourage high-school players to use better fundamentals, and we'd see better football." John Kanuit/Sports Studio Images/Getty Images Football rules were not given to Moses on Mount Sinai. If there's a problem with the rules, change 'em. Ryan Trost of Barrington, R.I., notes, "Only wrap-up tackling is permitted in rugby; ballcarriers cannot be hit-tackled, or hit for the sake of hitting. First offense sends the offender to the penalty box for 10 minutes, second offense is ejection." Al Steiner of Kalispell, Mont., suggests that taking its cue from rugby, American football should make all blows to the head illegal, regardless of whether they come from the opposing player's hands, arms, shoulders or head. Economist Tim Kane of the Kauffman Foundation proposes that a player who causes an injury must leave the game too and cannot return -- that day, that year -- until the other player heals. Mark Asher of St. Louis proposes, "Booth review of suspect hits, initiated by the booth official not a coach's challenge. If the review booth finds there was a flagrant helmet-to-helmet hit, eject the offending player. Using replay would relieve officials on the field of making split-second judgments about body position at game speed. If NFL players know the action can be stopped to review a hit, they may think twice about unnecessary roughness." Shaun Kepford of Minneapolis writes, "Many feel that stricter enforcement of the unnecessary roughness rule will give a big advantage to the offense. This could be alleviated by leveling the field by loosening the rules against defensive pass interference and illegal contact. While legislating vicious hits out of the game, the NFL should also legislate out dubious 40-yard pass interference penalties on third-and-long, or the five-yard defensive holding rule that grants an automatic first down even on long-yardage situations." Great point. As rules have been changed to reduce defensive contact on receivers, defenders tend to take out their frustrations with vicious hits once the ball arrives. In return for strict enforcement against vicious hits, let's stop penalizing pass defenders for minor-tussle contact. Carlos Goenaga of Houston writes, "On Monday Night Football the very day after the controversial big-hits Sunday, there was a piece about Chuck Cecil, the Titans' defensive coordinator. Highlights of what the Monday Night Football booth called Cecil's 'greatest' hits were shown. All were helmet-to-helmet hits -- and as of that day, grounds for suspension. Jon Gruden effusively praised vicious hits intended to cause harm. What kind of example does that set for young football players? Here's what Gruden said, as clips of Cecil hitting helmet-to-helmet were shown: 'Chuck Cecil, he's my guy. He could knock you out! He could knock you sideways! And he's a quality guy, he loves football.' Monday Night Football's message to high-school players -- want to be a 'quality guy' who 'loves football?' Lead with your helmet." Andy Lyons/Getty Images How come the trick-or-treaters at our door never look like this? Mark Roberts of Dallas notes Jim Tressel was quoted as saying vicious hits have more to do with players wanting to "get on 'SportsCenter'" or highlight film than actually trying to hurt someone. That's a reason "SportsCenter" and all similar sports shows should stop extolling big hits. Finally, Adam Spencer of Pleasant Plains, Ill., writes, "I suffered a football concussion during my senior year at Pleasant Plains High School -- it happened the week before the homecoming game. I wanted to play in the homecoming game so badly. I lobbied my coaches and the trainer to let me play. Today I am a junior at the University of Missouri, and I'd like to say thank you to my coach, Joe Oller, and to the doctor and trainer for putting my long-term health first and keeping me out of my senior year homecoming game." Single Worst Performance of the Season -- So Far: On the first of four Cleveland interceptions of Super Bowl MVP Drew Brees, the Browns were in a Times Square defense -- front seven walking around randomly pre-snap, to confuse the Saints' line call. At the snap, only three Cleveland players rushed, yet Brees was hit as he released, causing the pick. On this down, New Orleans offensive linemen Jermon Bushrod, Carl Nicks and Jonathan Goodwin all simply stood doing nothing, blocking no one, as their quarterback was hammered by a three-man rush. Just to prove it was no fluke, on the first David Bowens interception return for a touchdown, Bushrod, Nicks and Jon Stinchcomb stood blocking no one as Brees was hammered. On the second Bowens interception return for a touchdown, Goodwin and Jahri Evans double-teamed undrafted free agent Brian Schaefering of NAIA Lindenwood, who pushed both out of the way to hammer Brees as he released. On another series Nicks was called for holding, then cursed the closest official. That meant a flag for unsportsmanlike conduct, and because the cursing occurred dead-ball, both penalties were enforced, giving the Saints a first-and-35. New Orleans offensive line -- you are guilty of the single worst performance of the season. So far. Next Week: Adding to its acclaimed realism, "Madden 12" will suspend virtual players for helmet-to-helmet contact.